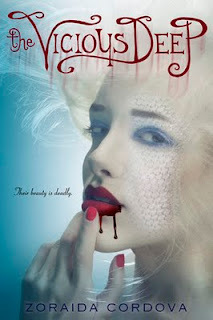 Set against the backdrop of a Coney Island summer comes The Vicious Deep, the story of sixteen year old Tristan Hart whose life is turned upside down when the mermaids make an unscheduled return to land in search of their new king. When a sudden storm pulls Tristan from lifeguard duty into a deadly riptide, he discovers what he really is—a prince of the Sea Court. Turns out, his girlfriend hopping and talents as a swimmer aren’t caused by his teenage prime hormones after all. In this modern Arthurian tale with a twist, when all a guy wants to do is get The Girl and enjoy the freak show that is a Coney Island summer, Tristan has to fight for his life, the lives of his friends, and his humanity, if he still wants it, as he’s caught in a race for a throne that is as ancient as the gods. I'm not 100% sure that this is the final cover. I saw this on the Apocalypsies blog, but couldn't confirm on Cordova's blog. I also didn't see it in the Sourcebooks catalog. Hmmm? Regardless, I think the premise is really interesting and I don't recall ever reading anything about sea horses. What do you guys think? **Update, this is NOT the final cover says Sourcebooks and Cordova. That should be released in a few weeks. And, this is about mermaids hence the word mermaid in the synopsis. I hear "Sea Court" and think seahorses. Is it Friday yet?